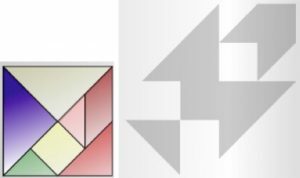 Arrange the 7 tangram pieces to make the shape in the grey picture. What do you notice about this shape? Describe the shapes of the tangram pieces. What is the same and what is different about the shapes of the tangram pieces? Make a pattern of your own using all 7 pieces. Click here for a template to cut out the tangram pieces. Click here to download Notes for Teachers.